Switzerland is a beautiful country—the white-capped Alps, the lush green valleys, the shiny mega skyscrapers. Wait, what? It just might be. 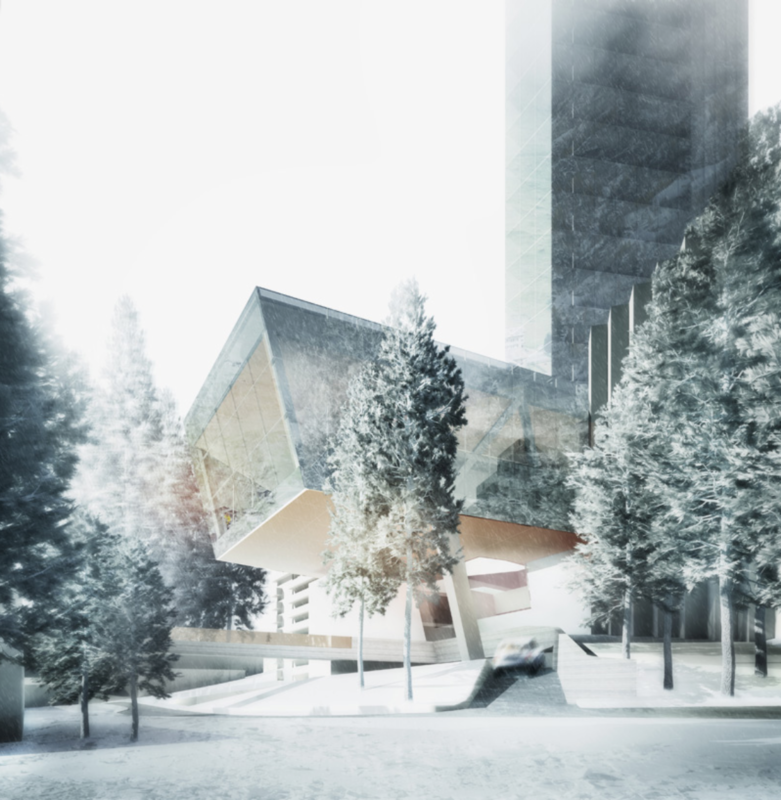 Morphosis Architects recently unveiled renderings for its ambitious 1,250-foot mirrored resort hotel in the sleepy Alpine village of Vals. The skyscraper, dubbed “7132” (Vals postcode), will be located adjacent to Japanese architect Tadao Ando’s Valser Path (slated for completion in 2017) and Swiss architect Peter Zumthor’s “The Therme Vals,” the revered high-end spa resort built in 1996 from 60,000 slabs of stacked quartzite, and will stand to become the tallest skyscraper not only in Switzerland, but in Europe. The 7132 Hotel is a controversial 1,250-foot resort skyscraper that dominates the surrounding Swiss Alps village of Vals, and obstructs some mountain views. Rendering of the transparent tower which (as the proposed tallest building in Europe) does its best to achieve the impossible—blending into the landscape. The luxury 7132 Hotel boasts 107 panoramic guest rooms and suites, a grand lobby, sky bar, restaurant, art gallery, library, ballroom, fitness and business centers, spas (of course), and a podium linking the tower to neighboring structures. It also offers village-shared public amenities such as a cantilever with restaurant, cafe and bar. The proposed tower boldly dominates the landscape next to the picturesque Swiss Alps, evoking an incredibly perplexing optical double-take. Are skyscrapers supposed to be in a rural mountainous area? That’s like building a massive barn in midtown Manhattan. Or gazing at a gorgeous person who’s missing eyebrows. It’s an intriguing spectacle, but it feels wrong. Something is off. The 7132 skyscraper towers over the surrounding village, obstructing some mountain views for miles while touting unobstructed views from the hotel rooms. Vals ongoing resort development is actually the brainchild of local residents— collaborators Pius Truffer (executive director of the complex) and Remo Stoffel (7132 Ltd. founder), who were both born in Vals. 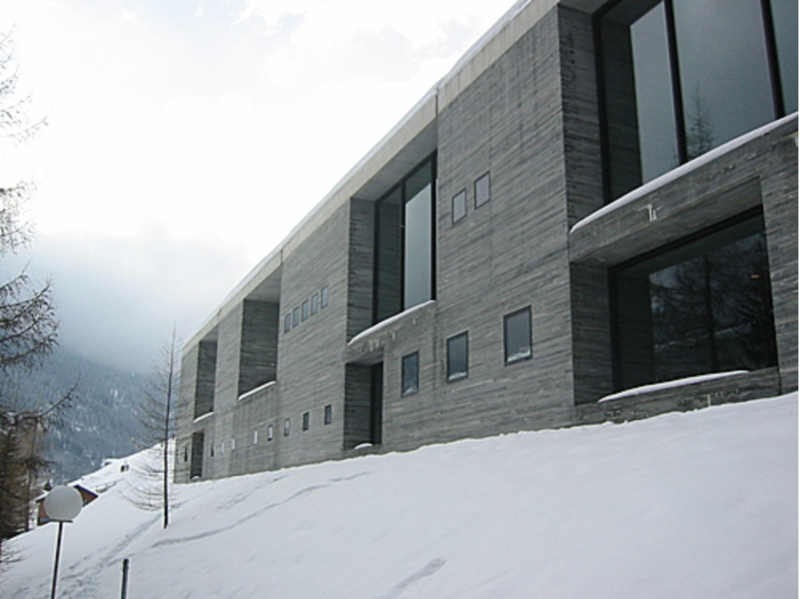 They also own and operate The Therme Vals, which was purchased from the municipality in 2012. The skyscraper hotel is is scheduled for completion by 2019. Their stated goal: for the 7132 tower to become one of the “five best hotels in the world,” attracting ultra-high net worth tourists from Asia and the Middle East. 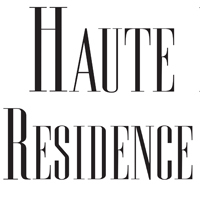 Rates will range from $1,043 to a jaw-dropping $26,063 per night. 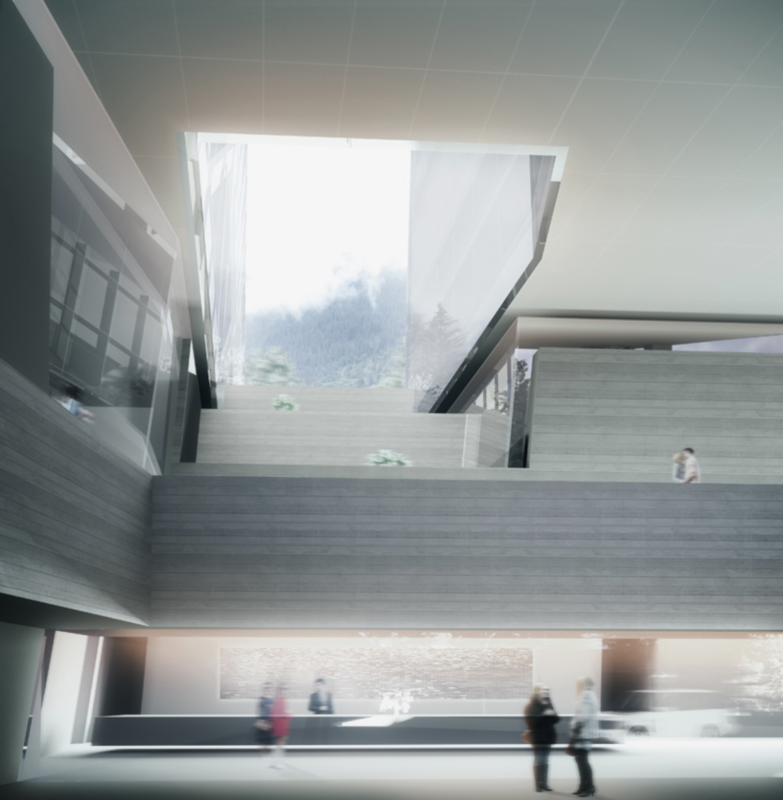 The hotel is the third wing of the 7132 project, which also includes The Therme Vals spa and the Valser Path. 7132 Hotel will offer 107 rooms from $1043 to an staggering $26,063 per night. Room view of the Vals valley. 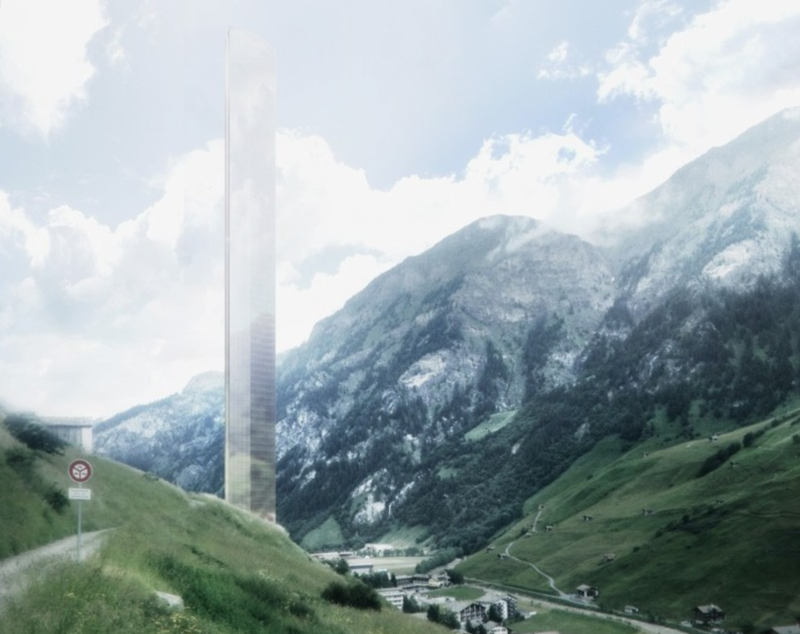 When constructed, the hotel will become the tallest tower in all of Europe, including Vals, a modest village with a population around 1,000 people that’s famous for being home to the only thermal springs in the Swiss Canton of Graubünden. The village’s Therme Vals spa has been a hallowed “site of worship for both bathers and countless design pilgrims since it opened in 1996,” according to The Guardian. However, the new 7132 resort tower is dealing with visceral backlash from harsh critics who consider it an eyesore, or worse. “Skyscrapers in the Alps are an absurdity,” said Vittorio Lampugnani, Professor of Architecture at the Federal Institute of Technology (ETH) in Zurich, who claims it’s unnecessary to accommodate that many people in such a small space in the mountains. Yes, the hills are alive with the sound of protest—even in Switzerland, the neutral nation. Although non-interventionist by nature, the landlocked nation of timepieces and chocolates is also steadfastly protective of its industries, culture, and land. 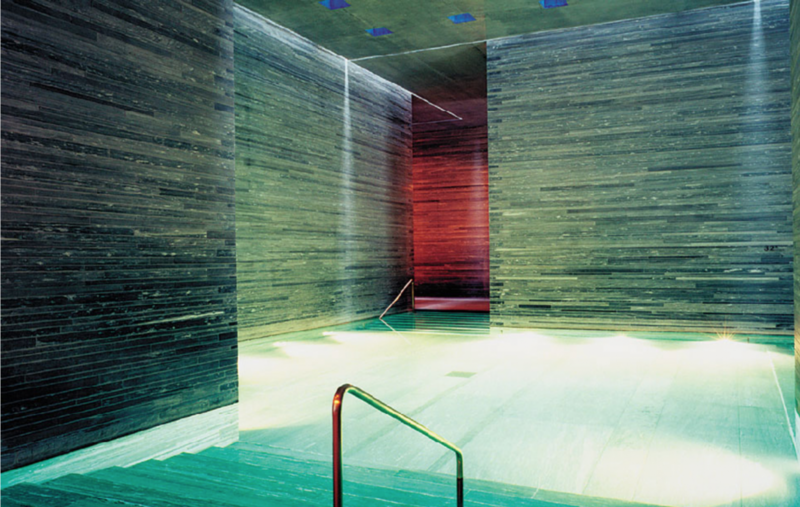 The controversy began when Stoffel wrangled control of The Therme Vals spa from architect Zumthor’s consortium. Then an international jury walked out on the development competition process citing significant question marks on factors such as the project’s scale. But Truffer and Stoffel are locals. 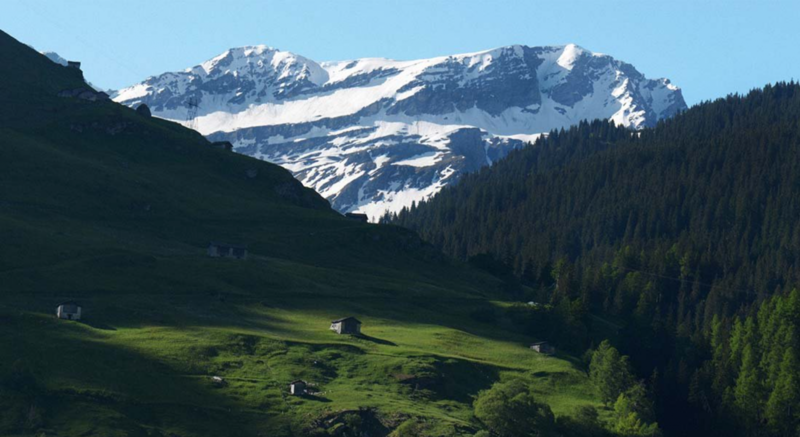 The loudest objections echo beyond the Vals valley (the Swiss are usually too polite to complain loudly). The avalanche of criticism comes from outside design observers who are apparently horrified by the 7132 hotel. The Therme Vals spa, a world-class tourist destination that contours to the Swiss Alps landscape. 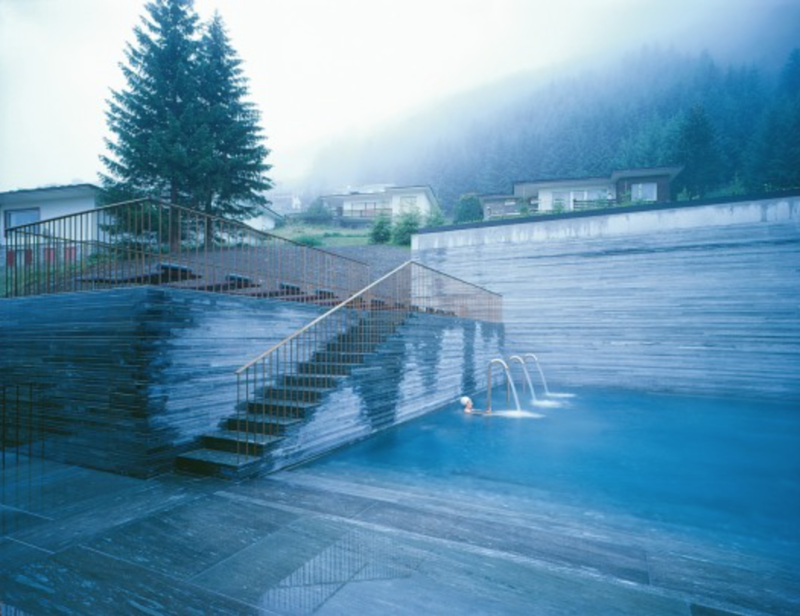 The Therme Vals spa features meandering light-and-dark labyrinths that flow through various pools. Therme Vals boasts a cave or quarry-like environment similar to the areas many quarries. 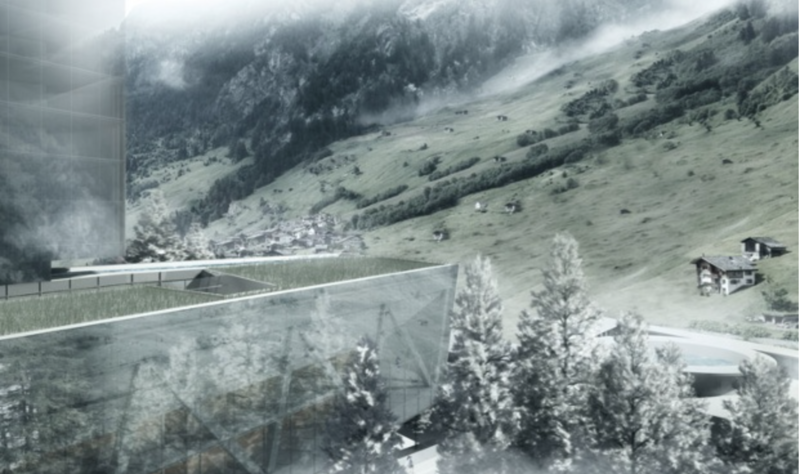 Just like The Therme Vals spa, the Therme spa is iconic for its design but also its environmental consideration. Inspired by Valser Quartzite slabs, Therme created a cave or quarry-like environment that respectfully contours to the natural surroundings—from bathrooms that lay beneath a grass roof structure half-buried into the hillside to the meandering light-and-dark labyrinths that flow through pools, bubbles and steam-saturated air for a complete sensory experience that recalls the ancient benefits of bathing. Its silent bathing experience receives rave reviews. 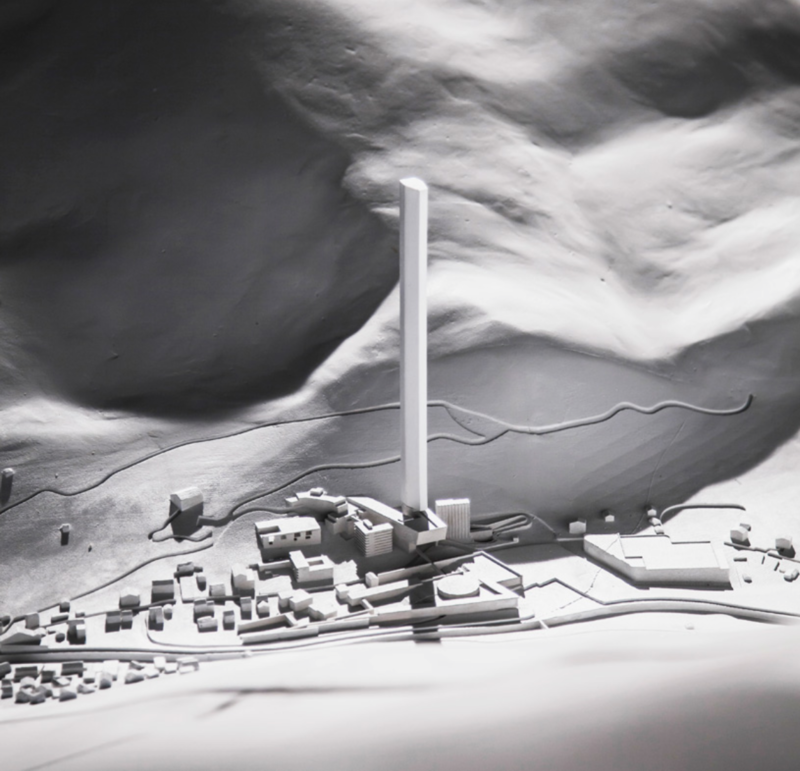 The Swiss Alp village of Vals is populated by an estimated 1000 people who will ultimately decide on the fate of the 7132 Hotel skyscraper. Vals’ magic formula is: 1,000 residents, 1,000 sheep and 1,000 hotel beds. Will the sheep be as confused by the skyscraper as we are? Judging by the fact that they pose for cameras, perhaps not. Can you really blend Europe’s tallest building into the Swiss valley landscape? The 7132 website bills the complex offerings as a rejection of mass tourism. How, by building a skyscraper hotel? The concept is a bit confusing but perhaps it would become clearer if we walked the Valser Path or soaked in Therme spa’s pools for awhile. The hotel, path, and spa complex is part of a big 7132 marketing blitz for the village that states “Vals’ magic formula is very simple 1000 residents, 1000 sheep and 1000 hotel beds. This magical ratio is the secret of the relaxed atmosphere in the Vals valley. Discretion is everything. Vals is sheer indulgence.” Indulgence for sure. Discretion? Again, let us ponder this in the calm, misty Therme waters. In Switzerland, the egos are small and the mountains are tall. On this one, the Swiss public and outside observers aren’t exactly neutral. The project still needs to secure planning permission, and it will be publicly voted on by Vals residents who will have final say. We shall see what happens when it’s completed. Until then, hold on to your sheep.